After lengthy delays, U Square at The Loop, a new mixed-use development planned for Calhoun and West McMillan streets just south of the University of Cincinnati’s campus, is finally set to begin construction in January. For Clifton Heights, it means the largest development since University Park Apartments (UPA) was completed in the fall of 2005. But for residents, it will mean construction and traffic detours through much of 2012 that will transform a long-vacant piece of real estate into $78 million development. The site once housed a smattering of drive-thru restaurants and a small collection of historic building stock, but was cleared in 2003 to make way for the development. The project then became entangled in a messy eminent domain case with Acropolis Chili and Inn the Wood restaurants which did not end until 2005 when UPA was completed across the street. 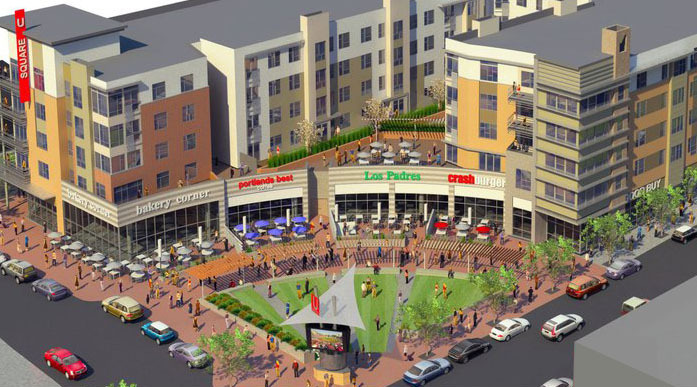 The $78M U Square at The Loop development is set to break ground in January 2012. “While there is undoubtedly a lot of work converging at once, we have phased a lot of other work in prior years,” explained Clifton Heights Urban Redevelopment Corporation (CHCURC) director Matt Bourgeois in reference to various streetscaping projects, renovation of Classen Park in 2010, and construction of 65 West Apartments in 2011. Developers anticipate groundbreaking on U Square at The Loop to take place in January 2012 on more than 150 apartments, two parking garages totaling 750 spaces, office and retail space. The final hurdle has been financing, and was finally cleared when the University of Cincinnati (UC) signed a lease on 40,000 square feet of office space for its Campus Services Department. The lease signed by UC then triggered the signing of several retailers which had signed letters of intent on approximately nine-percent of the development’s total street-level retail space. Those retailers include DiBella’s Old Fashioned Submarines, Great Clips and Firehouse Subs. Final drawings and permit acquisition for the project are currently underway, with site excavation set to begin soon. Developers say that the project’s two blocks—one primarily office and one primarily residential—will undergo construction simultaneously, with the residential component set to begin in late February and the office component to begin in mid-April. Though the smaller office block is expected to be complete by the end of 2012, developers do not expect the site’s residential component to be finished until July 2013. At the same time, city officials will continue streetscape improvements throughout Clifton Heights which will include two phases of work in the spring of 2012. A future phase of the development at U Square at The Loop includes the vacant “Gateway” site at Vine Street and Calhoun Street. There, a mid-rise office building is envisioned at what would become the junction between Uptown and Downtown streetcar lines.